Somewhere in the darkness in front of me, six huskies ran. They seemed to dance across the snow, hardly sinking into it at all as they pushed ever forward. Snow crunched under my sled, weighed down with two people and a heaping pile of reindeer skins. The dogs panted and the wind was doing its best to whistle in my ears, only to be muted by the two layers of wool I was wearing to keep out the -15ºC temperatures. The only photo I captured of our dogsledding adventure once I was bundled up in the sled and ready to go. I was in control of the dogsled, and despite the fact that I had done this three times before, it was still exhilarating. Sure, dogs don’t run as fast as a snowmobile, but the surge of adrenaline as the dogs take off for the first time, when the sled lurches forward and the cacophony of howling dies down as the dogs settle into their task, is just as strong. I’d made a mistake though. I had volunteered to mush second since my sledding buddy had never been on a dogsled before. She had been in control of our sled until we took a break midway along the track, and now she was nestled underneath the reindeer skins, gazing up at the northern lights that had just begun to dance above us while I tried to keep my mind on the task. The northern lights, captured later that evening in Kaaresuvanto. They were much brighter during our dogsledding trip. The aurora had appeared so gradually that no one actually believed it was there. The sky went from a bluish hue, lit by the full moon, to streaks of green so light it could have been mistaken for white. But soon, it was very apparent that we had been lucky enough to pick a night with quite the light show. The guides had pulled our sleds to a halt and given us a few minutes to stare in awe before pointing us back to the sleds, where the dogs waited eagerly. I was almost thankful when we found ourselves back in the forest on the way back to the kennels, since it meant that I no longer had to dance the fine line between watching the aurora and actually being in control of the sled. The dogs sped up, knowing that a big meal awaited them once they were unharnessed, and we careered between the trees and around the final corners before jolting to a halt. We were home, and that home was a farm called Hetta Huskies (located in the Enontekiö municipality of northwestern Finland). One of many noticeboards around the farm introducing you to its inhabitants. Taken on my original visit to the farm. Now, there was too much to do to even think of the northern lights. The dogs needed to be unharnessed, walked back to their kennels, and fed. The sleds needed to be unpacked and put away. It was a jumble of lights, people moving in what seemed like every direction at once, and dogs, who were either eating or jumping headlong into the snow to cool themselves off. As we left, Anna, the farm’s owner, waved goodbye from a house that also teemed with dogs. Because my visit to the farm was so fleeting — we drove there in the dark from a hotel in Kaaresuvanto, sledded in the dark, and were bundled off home in the dark — my memories from my trip there weren’t quite as tangible as others on my trip. 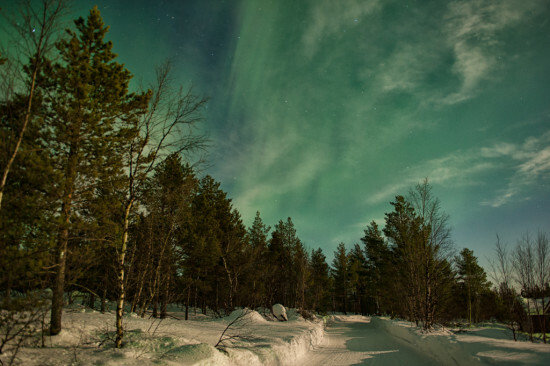 There are two main emotions that stand out, though: exhilaration, both at sledding in the dark and watching the northern lights dance above, and love. How could you not love this guy?! Why do I say love? 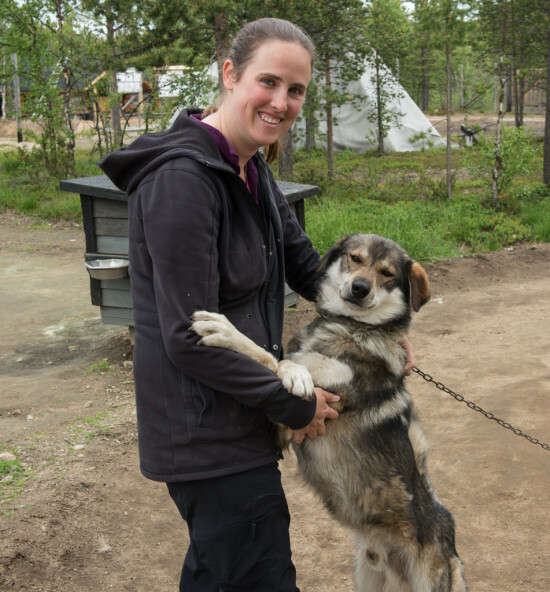 It was immediately apparent when we arrived at Hetta Huskies and met Anna (who owns the farm along with her adventurer husband Pasi), that she loved her dogs and her work. Everyone working there treated the dogs as family. They knew the dogs’ personalities inside and out and knew exactly how to best work with each one of them. And, when those dogs were injured, sick, or were just a bit too young to be outside on their own, they were welcomed into the house. On my return trip to Hetta two years after my original trip, I wasn’t expecting to be able to return to Hetta Huskies; after all, dogsledding is very much a winter sport and I was visiting only a few weeks after midsummer. Luckily, they offer both farm tours and activities in the summer; I had the chance to do both. As I walked around the farm with my guide, Rhi (an English student doing a summer of work experience), flashes of my previous visit kept popping into my head. I remembered the enclosure of puppies and the circular runs surrounding the males’ kennels…and I certainly remembered the howling. 150 dogs can cause quite a ruckus when they want to! As we walked in between the dogs, Rhi giving me a running commentary on how they train in summer to prepare for the long winter ahead, I could tell how much she loved them. She had only been there a few weeks, but already the dogs had gotten under her skin and I could tell how disappointed she was that she wasn’t able to stay for the winter season. Getting a cuddle from Aslan. Isn’t he adorable? And how could these dogs not get under your skin? While they are all trained to the highest standard, when they’re not on the job, they’re absolutely adorable. 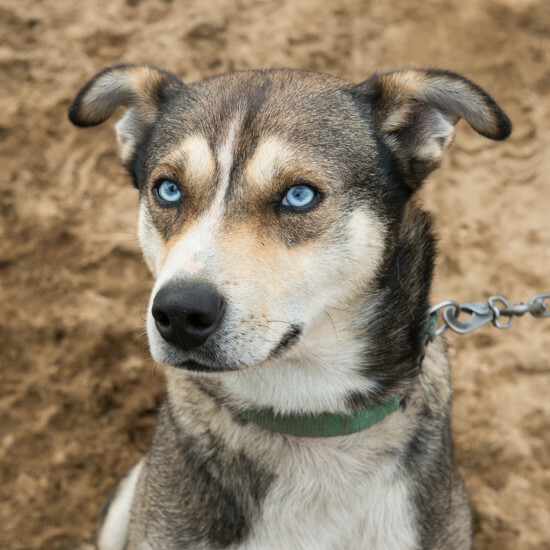 Some of the dogs are shy, but many greeted us with a giant bear hug and big husky cuddles. They happily wiggled through the dirt as we scratched their stomachs and jumped up onto their kennels in an attempt to get close enough to give us sloppy kisses. While I really wanted to learn more about a place that had been all too fleeting on my last adventure, I think I would have been happy just getting husky hugs all day too! I quickly learned that the logistics of dealing with a farm of this size could easily be overwhelming. 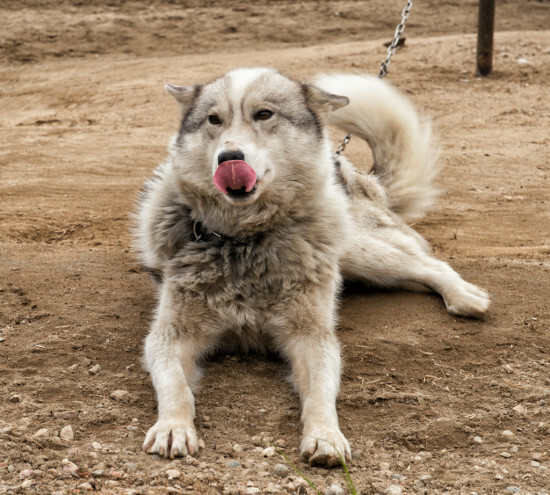 Despite having visited multiple husky farms across my two previous trips to Lapland, I truly had no idea of the record-keeping that’s involved to ensure that all of the huskies are trained appropriately and get rest when they need it. 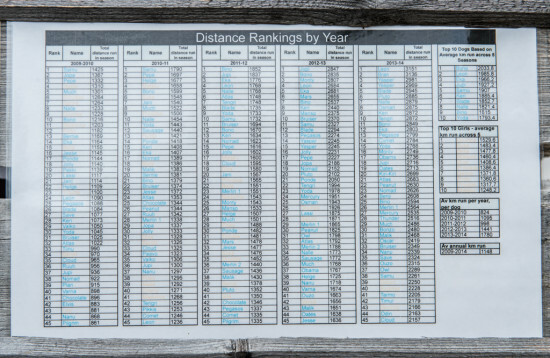 One of many charts around the farm, this one ranking dogs by the distance run each season. 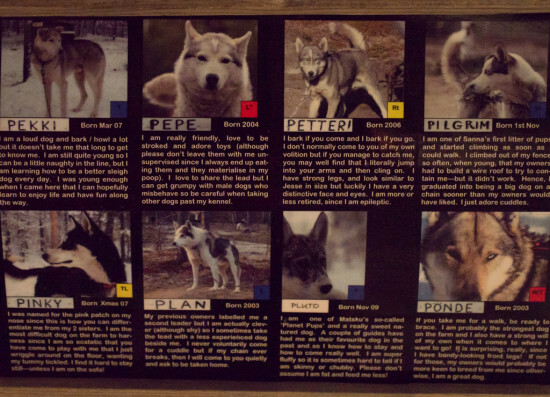 Rhi showed me a number of different charts; one detailed full personalities of the dogs down to the exact dogs they do and don’t get along with, and another detailed the full running history for each dog in the kennel. The guides manage to remember all of these details and make the picking of teams seem effortless come winter. It’s an impressive feat. While I loved getting to meet some of Rhi’s favourites — I don’t think I’ll forget Starsky and his beautiful, beautiful eyes — my favourite part of my farm visit was easily the visit to Shady Pines, the “retirement village.” Here, the dogs that are too old or otherwise unable to run anymore enjoy a huge area where they can roam and just generally enjoy the retired life. This is quite the oddity as far as husky farms are concerned. Sadly, many farms simply do not have the resources to care for animals once they are no longer making them money, so these dogs are put down. It’s hard to think about the number of gorgeous, well-trained dogs that have gone this way when they still have so much life left to live. 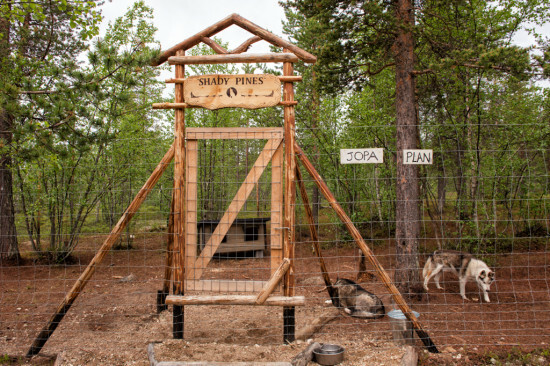 Shady Pines, the Hetta Huskies retirement home. Anna and Pasi feel the same way, which is why their retired dogs either go to the retirement village or are put up for adoption. Their adoption program allows people that have visited and fallen in love with a dog to adopt him or her once he retires, thus giving him a loving home during his twilight years. It’s an amazing program that has seen dogs move into happy homes as far away as America and South Africa. As Rhi, Pasi, and I suited up for our canoeing tour — a trip that would take us from Lake Muotkajärvi to Lake Ounasjärvi — it seemed almost wrong not to be taking a husky or two with us. That said, I’m not sure Starsky would have appreciated sitting in the canoe in the rain while we stayed dry under our waterproofs! 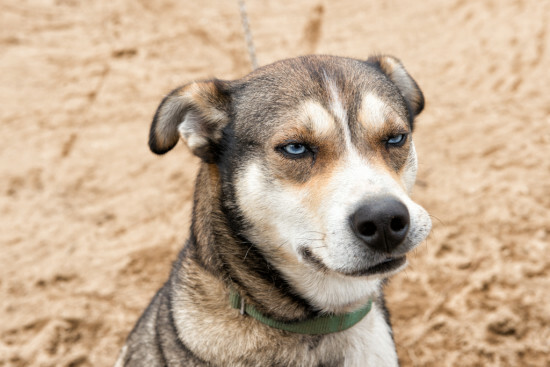 Starsky was not impressed with the summer weather Lapland experienced in 2015. 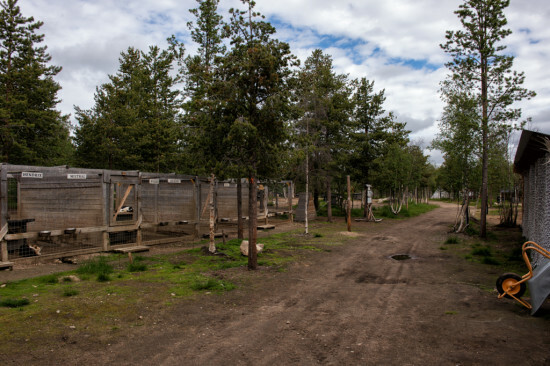 While I highly recommend the canoeing trip — and especially the hot stew Pasi served up in a wilderness cabin on the shores of Lake Ounasjärvi — for me, the highlight of my trip to Hetta was the chance to learn more about the Hetta Huskies farm. Aside from the fact that I left wanting to adopt a husky, I also left knowing that it is a place I could recommend without any reservations to anyone visiting Lapland. I myself hope to return one day so I can finally do that overnight husky trip I’ve been dreaming of for years. I can’t think of a better place to do it! My second visit to Hetta Huskies was sponsored by Tosilappi, but my original visit was self-funded. As always, all opinions stated here are my own. 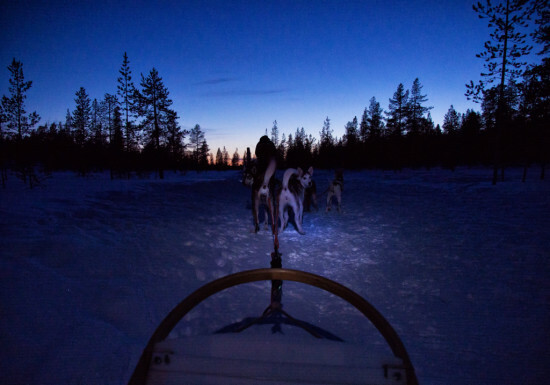 Hetta Huskies offers a number of single- and multi-day dogsledding treks throughout the winter months, with the shortest covering 6km at the cost of €65/adult and €45/child. 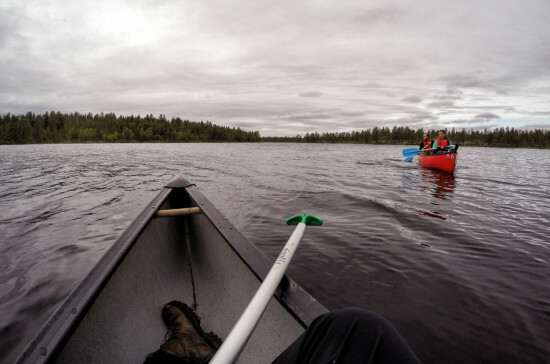 Canoeing on Muotkajärvi. I swear I did some paddling, despite the fact that I’m not even holding the paddle here! In the summer, the farm offers a number of different options, from farm visits like the one I did (40 mins, €8/adult, €5/child) to puppy agility training (where you walk the puppies through the training course — or they walk you! 1hr+, €20/adult, €15/child) to canoe and kayak adventures (the one I did was Muotkajärvi to Ounasjärvi, 4hrs, €90/adult, €65/child). Kristin, I enjoyed your post! I feel the same about being in control of a dog sled. My very first tour was 3 hours, 35 km! It was amazing and breathtaking. You enjoyed Northern Lights, I enjoyed the orange glow of a sunset in Swedish Lapland. Both hands firm on the sledge, it is difficult to take photos, I know.